This DVD is a collection of episodes from the show, My Little Pony: Friendship is Magic. 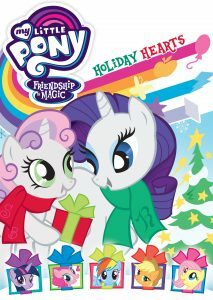 It’s a compilation of the holiday-based episodes from the show that follows Twilight Sparkle and her friends from Ponyville (Pinkie Pie, Applejack, Rainbow Dash, Rarity and Fluttershy) as they explore Hearts Warming Eve. I love how the animators pay attention to detail. Every character is quite unique. They don’t all look the same, even though they are the same type of pony. The main characters are also all different. Rarity and Twilight are both unicorns, but both are very different in the way they are imagined. Rarity looks way more fashionable with her wavy hair, while Twilight looks a little bit more ordinary.